Employers need access to an experienced employment lawyer and law firm that will pair proactive employee regulation strategies with assertive employment litigation defense. Fisher Law Office, PLLC, can help your business make the most of your most valuable resource: your employees. We proudly work with business owners in the Fort Myers, Cape Coral & Punta Gorda, FL areas. Effective workplace management starts with clear expectations. If your employees know what is expected of them, they are better able to do their work. Clear workplace strategies and employee handbooks are not only useful, in some cases they are required. They could include cash-handling policies mandated by your merchant service provider, construction workplace safety policies required by the Office Safety and Health Administration (OSHA), or processes to report workplace harassment recommended by the Equal Employment Opportunity Commission (EEOC). 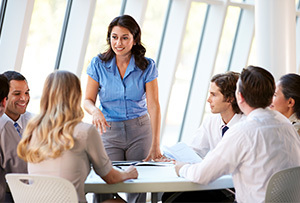 Crafting and communicating clear and effective employee handbooks and policies can avoid problems with your workers, and comply with federal and state employment agency requirements. Your employees won't all stay loyal forever. A better offer could come along, or employee misconduct may mean you need to cut ties. When an employee leaves, you need to be certain your legitimate business interests won't suffer from the separation. Binding confidentiality provisions, non-compete and non-solicitation agreements are all essential parts of your employee retention package. Whenever your business brings on a new employee – whether, hourly, salary or part-time – you need a signed agreement that protects your interests at the end of that business relationship. Fisher Law makes its clients' long-term interests a priority. Attorney Fisher will help you understand what you need to do in order to protect and preserve what makes your company unique, and prepare the necessary documents to make it happen. Even the best employment contract is only as good as the team that enforces it. Violations of your company policies, especially by former employees, can cost your business sales and undercut your market. When an unhappy worker decides your rules don't apply, you need an employment litigation attorney willing to take the matter to court. Attorney Peter Fisher has experience defending corporate interests in State and Federal Court. He'll help you file civil lawsuits for breach of contract and protect your business interests. State and Federal laws outline an employer's responsibility to prevent and respond to discrimination in the workplace. Employees faced with unsafe or hostile working environments need an experienced employment lawyer to help them file a discrimination claim, wage & hour violation, or safety concern with the right regulatory agency, or in federal or state court. Likewise, if your employee is not complying with state or federal laws, Attorney Fisher will help you protect your rights as an employer. When a worker claims that these anti-discrimination laws have been violated, your business could find your supervisors, managers, and even the owners of your businesses called before an administrative investigator or judge to answer the claims. Fisher Law will help you understand the administrative processes, and will appear on your behalf before the EEOC and other administrative agencies. Need an Employment Lawyer in Fort Myers, Cape Coral, or Punta Gorda, FL? Contact Us Today! Managing the people in your business doesn't have to be an ongoing headache. With proactive planning, careful drafting of employee handbooks and contracts, and an assertive litigation strategy, you can be certain that a working relationship turned bad doesn't ruin your company. Contact Fisher Law to meet with Attorney Peter Fisher and protect your interests as an employer.